In the early days of the Lewis and Clark expedition, Virginia native John Colter, one of the first recruits to the team and a skilled outdoorsman, developed a reputation among the crew as a discipline case. His habits of excessive drinking and disobeying authority led to his court martial in March of 1804 after he threatened the life of Sergeant John Ordway during the journey west; ultimately, the officers allowed him to continue after he issued an apology and a promise to reform. As the expedition continued, his experience as a hunter and outdoorsman established him as a valuable member of the Corps of Discovery; he often went out on extended overnight hunting excursions, providing much-needed sustenance to his compatriots, and he served as a wilderness scout and liaison with various Native American tribes in the area. During the two years from 1804 until 1806, Colter developed a familiarity with the region shared by few other white men of the time, and he took special note of the valley where three rivers combine to form the headwaters of the Missouri River. Nestled in the eastern portion of the towering Rocky Mountains in what is now southwestern Montana, the Three Forks river valley is separated from the lowlands only by the Bridger subrange of mountains that form its east side. Within the valley, three more or less parallel rivers—named by the Lewis and Clark expedition as the Jefferson, Madison, and Gallatin—coalesce into the Missouri. The area provided a trapper’s paradise, offering a bounty of highly-valued beaver furs, but was deep in the territory of the Blackfoot Indians, who harbored outright hostility to white men after one of their braves was shot and killed by Captain Lewis while attempting to steal a horse. By August of 1806, the expedition had returned to what is now North Dakota, where Captains Lewis and Clark granted Colter an early discharge so that he could accompany two other trappers who were heading back to the west. Two months later, Colter, once again on his own, met up with noted Spanish fur trader Manuel Lisa, who was in the process of establishing Fort Raymond, the first outpost for what would become the St. Louis Missouri Fur Company, about 50 miles northeast of present-day Billings, Montana, at the confluence of the Yellowstone and Bighorn Rivers. After helping with the construction of the fort, Colter, at Lisa’s behest, journeyed to the land of the Crow and Salish Indians with the intention of developing trade agreements. Throughout the winter of 1807-1808, Colter traveled on snowshoes and while carrying a thirty-pound pack and a heavy rifle, and in doing so became the first white man to explore what is now the state of Wyoming. Upon his return, Colter’s compatriots largely laughed off his reports of bubbling mud, arcing geysers, and pools of naturally steaming waters as tall tales of the purest bunk. Following the success of his trade mission, in the spring of 1808, Lisa once again dispatched Colter to serve as a liaison with the Crow, this time pairing him with fellow Corps of Discovery veteran John Potts. While the two men accompanied a force of approximately 800 Crow and Salish warriors to Fort Raymond, the party was attacked by 1500 Blackfoot. During the ensuing battle, Colter was wounded in the leg, but managed to drag himself to a thicket, where he continued to fire his rifle from a seated position. Ultimately, the Crow and Salish repulsed the Blackfoot attack and continued to the fort; after recovering from their injuries, Colter and Potts returned the following year to once again trap beaver in the Three Forks region. Aware that they were essentially invading and poaching on enemy land, Colter and Potts remained hidden during the day in order to escape detection, setting their traps at night and gathering their proceeds as the following dawn broke. One morning, as the two men canoed up the Jefferson River, they heard a commotion above the elevated riverbank to the east. Colter claimed that the noise was caused by Indians, but Potts insisted it was just buffalo, so they persisted up the river, whereupon they came face-to-face with a party of approximately 800 Blackfoot. Realizing that an attempt to escape would be futile, and expecting to only be relieved of his gear, Colter surreptitiously dropped his beaver traps into the river, over the side of the canoe hidden from the Indians’ point of view, before acquiescing to the Blackfoot demands to come ashore; the water was shallow and relatively placid, so Colter reasoned that he could come back later to retrieve his valuable gear. Upon reaching the shore, a team of Blackfoot instantly relieved him of his gear and stripped him naked. Potts, meanwhile, remained in the canoe out on the river. Colter urged him to come ashore, but Potts replied that he’d rather be killed “all at once” than be stripped naked as Colter had been. An impatient Blackfoot fired an arrow at Potts, striking him in the hip; Potts dropped in pain, and when he once again emerged standing in the canoe, he held his rifle in one hand. Potts shouted to Colter, saying that he was too gravely injured to escape, and that Colter should run for it; Potts promised to kill at least one of his pursuers. As if to underscore his resolve, Potts leveled his rifle and shot one Blackfoot brave dead in his tracks; instantly, as many as a hundred Blackfoot arrows riddled his body, after which enraged braves swarmed the canoe. The Blackfoot wailed with rage. Relatives of the slain warrior, tomahawks in hand, had to be physically restrained from striking down the defenseless Colter in their fury. The crush of warriors dragged Potts’s body to shore and hacked it to bits; enraged Blackfoot threw Potts’s eviscerated entrails in Colter’s face. Colter expected to be brutally dispatched at any moment, as Potts was, but retained some hope when he saw that tribal leaders were holding an impromptu council meeting to decide his fate. One of the elders—Colter would later describe him as ‘a Chief’—emerged from the meeting and, taking Colter to a spot about 100 yards away to the east, motioned for the naked man to run. Colter, somewhat confused, began to hesitantly walk, but the elder again waved his hand and again exhorted Colter to “Go, go away.” Colter peered over the elder’s shoulder and saw that several hundred of the younger braves were casting aside their blankets and leggings, while readying spears and tomahawks, and he realized he was about to play the part of the rabbit in a cross-country hunt. Colter launched himself into a full-speed sprint. With a whoop, the party of young braves dashed after him in pursuit, weapons hoisted, each intent on gathering the prize. Colter churned over the sharp rocks, stubby grass, and prickly pears of the Great Plains, needles driving into the soles of his feet, hoping to make the most of his meager head start. He kept his eyes straight forward, not even daring to glance over his shoulder; his ears churned with the sounds of hundreds of trampling feet behind him, motivating him to keep running. After about two to three miles, he felt his strength begin to wane, and blood from his nose dripped down his face and chin. From his knowledge of the land, Colter knew himself to be about halfway to the Madison River, which ran to the east, and there he hoped to find the means to elude his pursuers. Eventually, Colter hazarded a glance over one shoulder and saw that one brave had distanced himself from the rest; only about 20 yards behind, the singular warrior held a spear in one hand, and had a blanket draped over one shoulder. Sensing an opportunity, Colter—naked, exhausted, and caked in blood—abruptly turned around, threw his arms wide, and faced the young man. The Blackfoot, taken by surprise, launched his spear and himself at Colter, who knocked away the tip with one hand, cracking the lance in two; the brave, over-extended and off balance, stumbled to the ground. Colter snatched up the broken spear head and impaled the Blackfoot to the ground; instinctively grabbing the blanket from the fallen man’s shoulder, Colter again darted toward the safety of the Madison River. Fortunately for Colter, the rest of the pursuing Blackfoot momentarily halted their chase at the sight of their fallen companion, providing enough of an additional lead for him to reach the shores of the Madison. Colter turned briefly from the safety of the treeline and still saw the horizon teeming with Blackfoot before diving into the river. Still naked but with the blanket in hand, Colter quickly spotted a beaver house not far from the shore, like an enormous overturned basket in the middle of the water. He dove underneath its branches and emerged beneath and within the wooden structure, elevating himself to the second internal level of the large den. He brought the waterlogged blanket up with him, and hid. Colter could hear the Blackfoot reach the river bank, spreading out to search the area in search of their dangerous prey. He expected at any moment that they would hack the beaver house to bits, or set it on fire; at several points they were within inches of his prostrate body, walking along the top of the wooden mound in which he hid, shivering and drained. In time, the Blackfoot continued across the river and journeyed to search the plains beyond; Colter remained in his hiding place, and two hours later the band returned, crossed the Madison River, and headed back west to rejoin their tribe once again. Remaining inside the beaver house until nightfall, the naked, shivering mountain man finally swam out of the beaver house, heading downriver and, still clutching his soaked Blackfoot blanket, emerged onto land and started the long walk back to Fort Raymond. Colter ran for about thirty miles toward the Bridger Mountains to the east. Knowing that the only nearby gap would likely be monitored by the Blackfoot, he instead climbed a near-vertical cliff in the mountains, an endeavor which took him an entire night to complete. He hid the following day among the snow-capped peaks, relying only on his singular blanket for warmth, before descending the other side in the morning, and thereafter continuing his jog across the Great Plains. He traveled across the Montana wilderness as winter approached for 300 miles, subsisting on roots, bark, and prairie turnips; finally, 11 days later, he reached Fort Raymond, naked, sunburned, and emaciated; his condition was so dire that at first, even his close companions didn’t recognize him. John Colter would continue to haunt the Three Forks region for another year. The winter after his escape, he returned for the traps he had dropped in the water, and narrowly escaped another ambush as he sat alone at his campfire. He finally retired from the area for good in 1810 after hearing of two more friends being killed while he helped build a second fort in the area. Later, he fought with Nathan Boone’s Rangers in the War of 1812 before marrying a woman named Sallie and retiring to a Missouri farm, where the couple had a son, Hiram. The possibility always remains that this story was embellished; various retellings differ in minor points, and the only ultimate source of the information is based on the telling of John Colter himself. Unfortunately, the casting of Native Americans as nameless barbarians and a poacher as the plucky hero is not unique to this story. Nevertheless, John Colter’s tale of escape against the odds remains one of the seminal tales of survival in the Old West. His death is similarly vague, having probably occurred in 1813 in Missouri due to jaundice, but no one knows for sure. The Journals of the Lewis and Clark expedition, available online here. Undaunted Courage, by Dr. Stephen Ambrose; Simon & Schuster, 1997. Three Years Among the Indians and Mexicans, by Thomas James; printed at the office of the War Eagle, Waterloo, Illinois, 1846, available online here. Histories and Stories of Nebraska, by Addison Erwin Sheldon, 1913. Travels in the Interior of America, by John Bradbury; Sherwood, Neely, and Jones, London, 1817, available online here. Portrait of John Colter by Gerry Metz. Painting "John Colter, Out for Beaver" by William Ahrendt. Detail of Painting "Blackfeet Burning Crow Buffalo Range" by Charles Marion Russell. 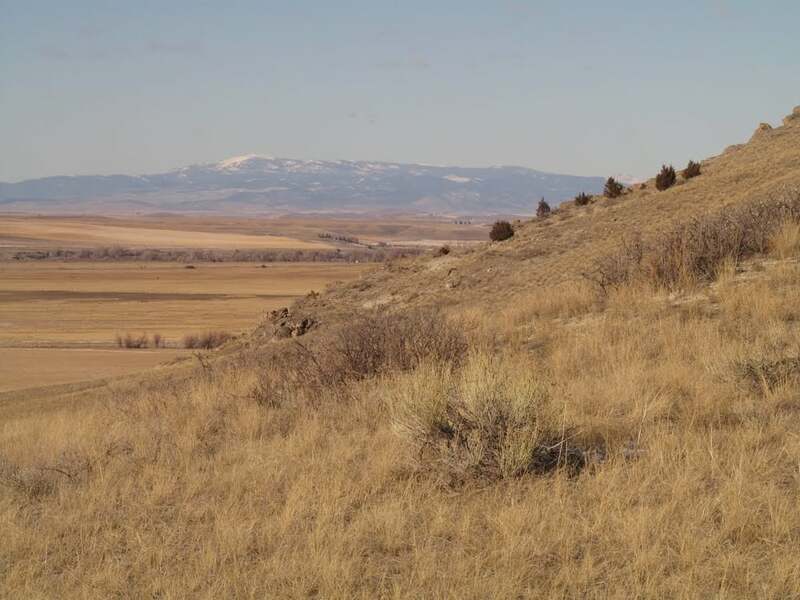 Photo "Golden Hillsides and Distant High Mountains in Madison Buffalo Jump State Park, Montana Jan 14" by David Cure-Hryciuk via Google Earth. Photograph "Beaver House" by Gordon P. Glew. Photo of Bridger Mountains by J. Belote via Google Earth. Panoramic view of the Yellowstone River by Montana Matt. Cover photo "Approaching the Rocky Mountains" from Frances Hunter's American Heroes Blog.